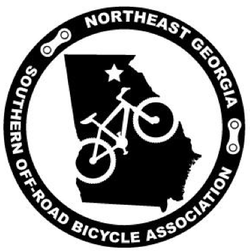 ​ 501(c)3 mountain bike advocacy organization located in northeast Georgia. Experience what thousands of riders are talking about on Sunday, April 14th. The extraordinary ride of Jamis Bikes' all-new Hardline® and Portal® 3VO Suspension bikes. For those interested in getting your drop-bar gravel fix we'll also have new Renegades available to demo. ​See our Events Page for more details. YPT Fans, good news! We have opened the newest trail at Yonah Preserve. It is a short warm up loop that is ADA accessable and kid friendly. This completely volunteer built section of trail is accessed from the parking lot and is designated with 50 series trail markers. The entrance is to the right of the boat ramp access road. It is a great warm up loop and is kid friendly as well. Just look at one of our new users on her strider bike enjoying the new segment. Northeast Georgia SORBA would like to thank Ron Cantrell Construction, Inc. for their generous donation of our trailhead kiosk. They donated all of the labor and materials for the design and construction. ​Thank you so much for your beautiful contribution to our project! Check out the new kiosk before your next ride at the Yonah Preserve Trails. Mountain bikers have a rare opportunity to pass important legislation to create, enhance and protect the places we ride by December 21, and this is our last good chance to tell our representatives to act. Congress is working on a package of outdoor recreation bills, many of which IMBA has helped craft and has advocated for throughout this legislative session. It’s time to get these bipartisan bills across the finish line. Please contact your representatives and tell them time is running out—you demand action for outdoor recreation! The Land and Water Conservation Fund, the Recreation Not Red Tape Act, the RTP Full Funding Act, the Restore Our Parks and Public Lands Act, and the Every Kid Outdoors Act all create more and better opportunities for mountain biking and outdoor recreation, all across the country. You can read more about the bills here. In the Bitterroot National Forest, a series of rulings have currently closed 120 miles of cherished backcountry trails to mountain bikes. Even after decades of trail maintenance and the trails falling into disrepair without mountain bikers having access to maintain them, mountain bikers are now banned from these special rides. Please, speak up here to protect Montana trails. The comment period closes November 19. Come join us for this inaugural event at Chicopee Woods Mountain Bike Trails. This ride will be a no-drop social ride with your fellow mountain bikers. We will ride some great trails, hang out with friends, and you'll be off the trails in time to enjoy turkey dinner with your family. Annual Park Pass or Gate Fee Req'd, rain date will be the following day on Friday. View our Events Page for more details. A company relocating its headquarters from California to Hall County later this year is expected to create up to 800 jobs. Fox Factory Holding Corp., which manufactures and designs ride dynamics products for bicycles and powered vehicles, already has offices off of Ga. 53 in Braselton. Later this year, the company will relocate its corporate headquarters to that Braselton office before settling in at a new 23-acre site at Gainesville Industrial Park West on West Park Drive.